With finite petroleum reserves and record fuel prices a daily part of the media drumbeat, Yves Kinard has impeccable timing. 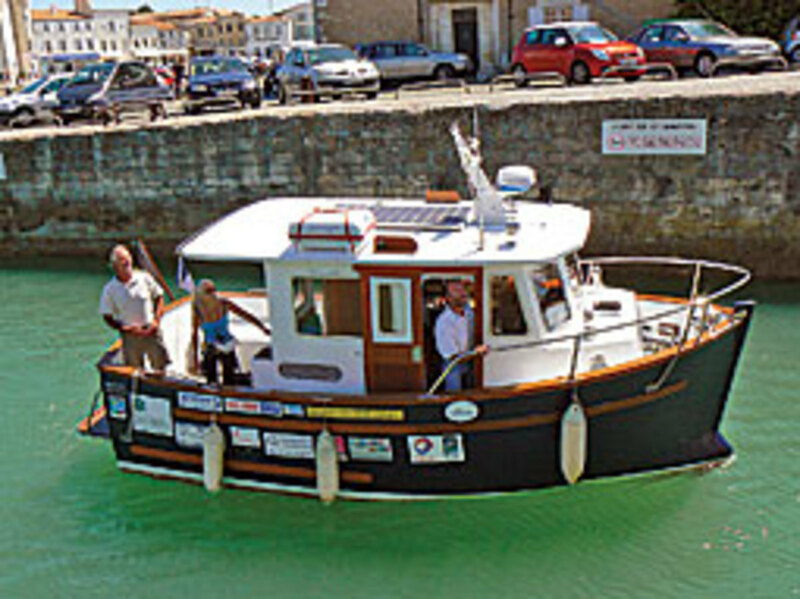 The 52-year-old French naval architect and sailor crossed the Atlantic this summer from Bermuda to France in a fuel-efficient 21-foot prototype — the Mayrik P214 Mini Trawler — along with his partner, Patrick Brachet, 47. So how fuel efficient is the little voyager? Kinard, a naval architect with Mayrik Yacht Design of St. Martin in the French Antilles — the designer and builder — named the prototype Spirit of Arielle after the 43-foot vessel fellow countryman Marin Marie took across the Atlantic in 1936, from New York to Le Havre, in 19 days under both sail and diesel power. Spirit of Arielle is powered by a Perkins M92B, a 4-cylinder, in-line, water-cooled, naturally aspirated, direct-injection diesel. It is the next generation of Perkins’ successful M92, and is said to offer 6 percent better fuel economy. Maximum power is 86-hp at 2,400 rpm, according to Perkins. The boat’s bulbous bow and variable pitch Autoprop also add to its fuel efficiency, and a 150-watt solar panel powers some of the electrical needs on board. Kinard says he made a top speed of 5.6 knots on the voyage. 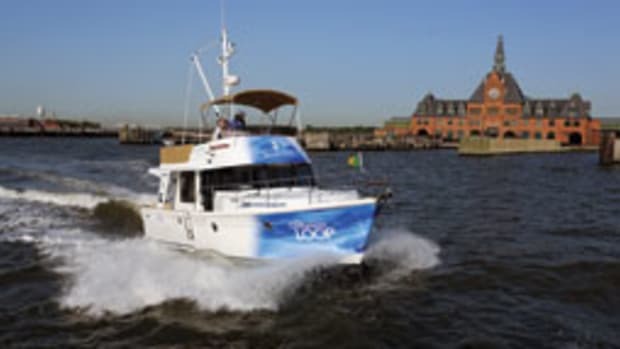 For the 1,850-mile run from Bermuda to the Azores, where they refueled, he says the boat used 1,200 liters, or 317 gallons — nearly 5.8 miles per gallon. Kinard and Brachet originally planned to arrive in France by the end of June, but their departure from Bermuda was delayed. They made port July 15 in St. Martin de Ré. Spirit of Arielle proved seaworthy and operated without a problem, says Kinard. “We built the cockpit deep, and we never had a wave come into it, even in heavy weather,” he says. The boat weighs about 5 tons and has a good amount of freeboard. Kinard says the roughest conditions they experienced were in the two days after they left Bermuda. He says the little boat performed remarkably well in 13- to 14-foot seas and winds to 35 knots. “She’s good and solid,” he says. The layout maximizes space and includes a saloon/galley with a stove, sink and countertop; a head with a shower; a dining area for one to four people; and a forward cabin with two berths. She carries 80 gallons of drinking water. “Now that I have returned to France, I hope to take my trawler to La Rochelle in September for the Le Grand Pavois boat show,” says Kinard. “I hope someone will be willing to put this model into production now that we’ve accomplished our voyage.” Kinard estimates a production version of the P214 would cost about $150,000. The prototype cost about $285,000. 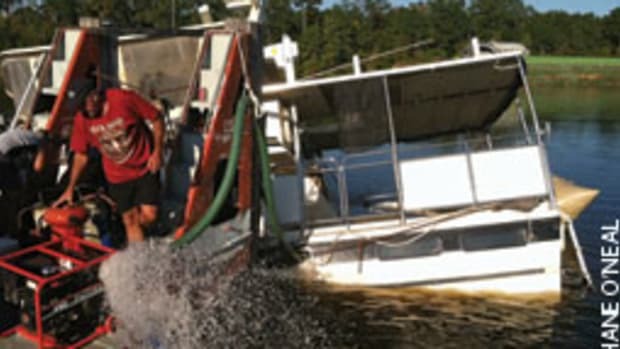 Did fuel prices change the way you boat?